download Full MiniFiche (pdf, 6.8 mb) with supplementary images. 2 History of building: The Sirius Building is constructed overlooking Sydney Cove. In the 1820s Sydney’s most prominent merchants built villas on Bunker’s Hill, Dawes Point and Millers Point overlooking their private wharf complexes. In the 1840s additional housing was built including a series of townhouses with frontages to Cumberland Street and rear entrances to Gloucester Street, which ran along the top of a cliff. Gloucester walk still follows this alignment. Following the outbreak of plague in Sydney in 1900 the entire area was resumed. Substandard housing was demolished. Cumberland and Gloucester Streets were realigned, resulting in the demolition of the townhouses and villas at the northern end of the street. From 1914 the site was redeveloped. The NSW Housing Board erected bond stores (Rowan’s Bond) and the Mercantile Shipping office. Below the shipping office was a warehouse, the roof of which carried part of the realigned Cumberland Street. The structure, the first reinforced frame to have been built in Sydney, was built by the Public Works Department and was then infilled to form a warehouse by the Housing Board. Following the dissolution of the Housing Board the properties remained in Government ownership, passing to the Maritime Services Board in 1936. A competition was held for the redevelopment of the entire area however this did not go ahead. A new State Government agency was created, the Sydney Cove Redevelopment Authority, tasked with redeveloping the area In 1972 Kings Parking Company proposed to build the East Rocks Car Park however this proposal, which would have seen an eight-storey car park erected at the northern end of Cumberland Street, did not proceed. The proposal to demolish the majority of the buildings in the Rocks area and build high-rise buildings had resulted in a green ban first being imposed by the Builders Labourers Federation (BLF) in December 1971. Additional green bans followed when it became apparent that local residents were not going to be able to afford the proposed new apartment block. SCRA produced an article outlining the ‘rehousing program for the East Rocks tenants’. Assistance was to be provided by the Housing Commission, but only to pensioners and existing residents who qualified for assistance. 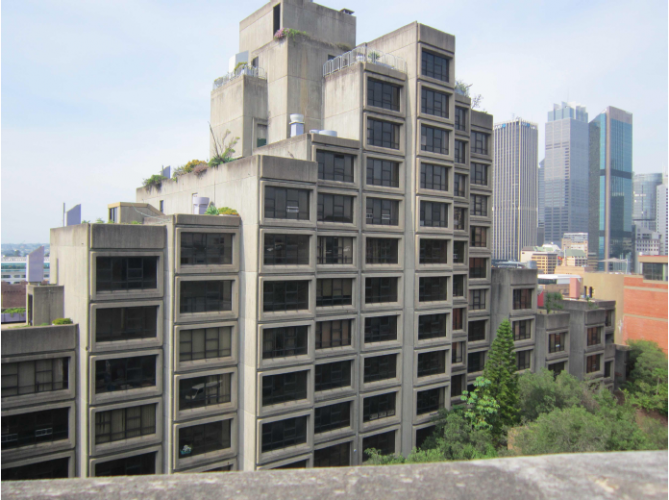 A compromise was eventually negotiated that saw the demolition of Rowan’s Bond Store and the construction of a large block of public housing known as the Sirius Apartments designed by Tao Gofers for the NSW Housing Commission and built by Alexander and Lloyd. The Sydney Cove Redevelopment Authority named its redevelopment projects after the ships of the First Fleet. In addition to the demolition of Rowans Bond, the southern half of the warehouse built by the Housing Board, including the former shipping office, was also demolished. Final designs were submitted to the Sydney Cove Redevelopment Authority in 1977. The initial design was modelled to ensure that views from the bridge to the Opera House would not be obscured and the urban design advice was sought. The building application to erect a new block of residential flats buildings at 2 – 36 Cumberland Street was submitted in December 1977. Repairs were undertaken to Gloucester Walk in 1979 and the first tenants of the new housing block moved in during 1980. During the 1990s terminally ill patients were housed in the block, which has expansive views of Sydney Harbour and the Opera House. The World Heritage listing of the Sydney Opera in 2007 included a Buffer Zone and the Sirius building sits within that buffer zone. A change in government policy has seen the sale of all of the properties in The Rocks and Millers Point occupied as public housing, including the series of purpose designed model workers housing erected 1906-1920 and the Sirius Building erected by the NSW Housing Commission. The National Trust submitted a nomination for State Heritage Listing that was unanimously approved by the NSW Heritage Council. The minister refused to list the building. This decision was successfully challenged in the Land & Environment Court however the NSW State Government still refused to list the building. As the foundations of earlier buildings remain on the site, the area is still subject to certain NSW Heritage Act provisions. As of December 2017 the building has been put up for sale and only one tenant remains. The action by the State Government to displace longstanding tenants has received international news coverage. the building rose above the level of the Bridge’s roadway. panels. The floors are concrete floor slabs. replaced a bond store erected c. 1920. The Sirius Apartments were funded, designed and built by the NSW State Government to house community members of the Rocks/Millers Point who were displaced by redevelopment. To ensure this occurred a union ‘Green Ban’ was placed on the site by Jack Mundey and the Builders’ Labourers Federation. The housing block has a direct, strong and special association with the Rocks/Millers Point Community of long-term residents and direct descendants of maritime workers that the public housing in the area was initially created for. Aesthetically significant the excellence of its Modernist design as a Brutalist building, the design of this well-executed and relatively intact example of late 20th century public housing, part of a series of buildings as urban development by the NSW Housing Commission during the 1970s. Sydney Harbour Bridge and from many points in Sydney Cove. It is also well known for its association with the Union ‘Green Bans’, bans that saw the retention of historic areas of Sydney proposed for wholesale redevelopment. The building was also well known for a sign announcing ‘One Way! Jesus’ was displayed in the window of Unit 74 facing the Bridge for more than 15 years. More recently the building has achieved iconic status through the campaign mounted by Save our Sirius to save the building from demolition. from Woolloomooloo were housed in the block. Harbour Bridge, will be proceeded with when funds permit.